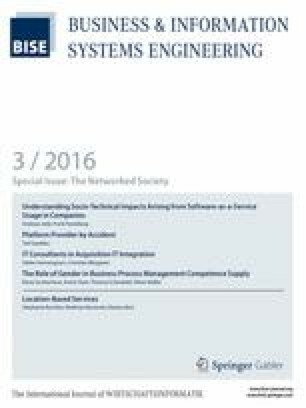 This manuscript is an extended and revised version of a conference paper of the same authors presented at the 23rd European Conference on Information Systems (ECIS 2015), which was selected by the editorial board of the ECIS 2015 Special Issue of the BISE (Business and Information Systems Engineering) journal for a fast-track review process. The online version of this article (doi: 10.1007/s12599-016-0428-2) contains supplementary material, which is available to authorized users. This work is part of a project that has received funding from the European Union’s Horizon 2020 research and innovation program under the Marie Skłodowska-Curie Grant agreement No 645751. Any opinions, findings, and conclusions or recommendations expressed in this paper are those of the authors and do not necessarily reflect the views of the European Commission. We gratefully acknowledge the support of Ms. Megha Anand during the data collection process.